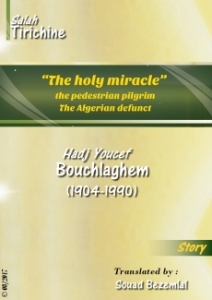 Hadj Youcef BOUCHLAGHEM was an ambitious and a courageous man who set a goal and decided to achieve it. His journey to the sacred places twice on foot was a miracle recorded by history to generations. Although the trip was too long and difficult, he succeeded to overcome all the obstacles due to his strength and determination. Moreover, his remarkable attitudes toward all the situations he faced served as valuable lessons thanks to his great humanity, his moral values and his culture. Tirichine Salah ibn Omar was born in 1952 in Beni-Isguen, Ghardaïa, M'zab. A teacher of Mathematics. A Mozabit poet, wrote two books : "My Heart"and "Memory of the Years", in addition to "the Series of the Burning trips". He is the creature and animator of the mission "izelwan Wa thurat" Poems And Heritage" in the Algerian Radion, Station of Ghardaïa. Mozabit is the mother language of the region of M'zab in the Sahara of Algeria.